Methods for bit allocation and power tuning for optimizing a setup time in a multi-channel communication system. In one aspect, a bit allocation method includes measuring a signal-to-noise ratio (SNR) of each subchannel of a channel, determining a greatest allocable bit number of each subchannel using the measured SNR of the subchannels, determining a sum of the greatest allocable bit numbers of the subchannels, and determining a difference between the sum of the greatest allocable bit numbers of the subchannels and a target bit number. For each subchannel, a currently allocated bit number of the subchannel is set equal to the greatest allocable bit number of the subchannel, if the difference between the sum of the greatest allocable bit numbers and the target bit number is less than or equal to a predetermined value. On the other hand, for each subchannel, a currently allocated bit number of the subchannel is set to a value that is reduced from the greatest allocable bit number of the subchannel by a predetermined ratio, if the difference between the sum of the greatest allocable bit numbers and the target bit number is greater than the predetermined value. The currently allocated bit numbers of one or more subchannels is adjusted until a sum of the currently allocated bit numbers is equal to the target bit number. In other aspect, a transmission power of one or more subchannels is adjusted to make a margin of each of the subchannels substantially conformal. This application claims priority to Korean Patent Application No. 2002-17084, filed on Mar. 28, 2002, which is incorporated herein by reference. These and other aspects, features and advantages of the invention will be described and become apparent from the following detailed description of preferred embodiments, which is to be read in connection with the accompanying drawings. FIG. 5 is an exemplary diagram illustrating a margin distribution of each subchannel that can be obtained using a bit allocation method according to the invention that includes fine-tuning of transmission powers. FIG. 1 is a schematic diagram illustrating a transmitter and a receiver of a multi-channel communication system. The system generally comprises a transmitter  10 and a receiver 30 which transmit and receive data over communication channel 20. The transmitter 10 includes a bit allocator 11, a QAM (Quadrature Amplifier Modulation) encoder 12, a transmission gain table 13, a modulator 14, and a digital-to-analog converter 15. According to the T1E1.413 ADSL standard, a line code scheme called DMT (Discrete Multi-Tone) is used, which divides the spectrum from 4 kHz to 1.1 MHz into 255 4.3125 kHz subchannels. The bit allocator  11 determines the bit number of data that will be transmitted by each subchannel. The bit allocator 11 may be implemented using a data processing device such as a DSP (Digital Signal Processor). The QAM encoder 12 converts the transmitting data generated from the bit allocator 11 into QAM data. The transmission gain table 13 controls the transmitting power of the QAM data of each subchannel by using transmitting gains stored in the transmission gain table 13. The modulator 14 receives data from the QAM encoder 12 and sequentially performs IFFT (inverse fast Fourier transform), addition of a cyclic prefix, and parallel-to-serial conversion. The digital-to-analog converter 15 converts digital data generated from the modulator 14 into an analog signal to transmit the analog signal through a channel 20. A detailed description of modes of operation of the bit allocator 11 and the transmission gain table 13 according to preferred embodiments of the invention will be described in detail below. The receiver  30 includes a filter and analog-to-digital converter (ADC) 31, a time-domain equalizer (TEQ) 32, a demodulator 33, a frequency-domain equalizer (FEQ) 34, a QAM decoder 35, and a bit de-allocator 36. The filter and analog-to-digital converter 31 filters an analog signal received from the channel 20 to convert the analog signal into a digital signal. The demodulator 33 receives data from the filter and analog-to-digital converter 31 and the TEQ 32, and sequentially performs serial-to-parallel conversion, removal of a cyclic prefix, and FFT (fast Fourier transform). The data generated by the demodulator 33 is in a frequency domain, and the amplitude and phase of the data are distorted by a frequency characteristic of a communication channel. The distorted data are corrected by the FEQ 34, and the corrected data are input into QAM decoder 35. The QAM decoder 35 receives the corrected data to perform QAM decoding. The bit de-allocator 36 de-allocates data of each subchannel generated from the QAM decoder 35 to the original data. In an ADSL or a VDSL system, there is a significant difference between the desired data rate and the data rate that is obtainable from the system SNR. The desired data rate is always less than the data rate obtainable from the system SNR to meet a target system margin. If the target bit number according to the desired data rate is B target and the total bit number obtainable from the system SNR is Bmax, Bmax is always greater than or equal to Btarget (Bmax≧Btarget). The target bit number is variable to ranks of users. FIG. 2 is an exemplary diagram illustrating SNR of a multi-channel communication system. In FIG. 2, the solid line represents SNRs for subchannels, and b i is the greatest allocable bit number of the ith subchannel. The variable bi should be an integer and, especially in ADSL or VDSL system, bi should be more than 1 (bi>1). But, in G.DMT.BIS of the ADSL system, it should be possible that bi is equal to 1 (bi=1) so as to perform one-bit loading. In Equations (1) and (2), b i should be an integer. Accordingly, even if the bit loading is performed with a system margin Υm, a system margin of each subchannel may be more than Υm. To solve the problem that the system margin is variable to each subchannel, a fine-tuning process according to the invention is preferably performed as discussed in detail below. In an ADSL or a VDSL system, the target bit number B target according to the desired data rate is not set to be equal to the total bit number Bmax that is obtainable from the system SNR, to limit data rate according to ranks of users. In other words, there is always a difference between Btarget and Bmax. Consequently, the bit allocation algorithms can require a significant amount of computation (and thus processing time) to perform bit allocation. Therefore, a reduction in the number of computations of the algorithm can optimize the performance of the ADSL or VDSL system. Advantageously, in accordance with one aspect of the invention, Bmax is preferably adjusted such that there is little difference between Btarget and Bmax at the beginning of the bit allocation process. As explained in detail below, this is preferably achieved by adjusting a system margin Υm that is required for the bit loading. FIG. 3 is a flowchart of a bit allocation method according to one aspect of the invention. The method of FIG. 3 is preferably implemented in the system of FIG. 1. Initially, in S 100, a target bit rate Rtarget is initialized according to a target bit error rate Pe. In a typical ADSL system, the Rtarget is more than 6 Mbps and the Pe is 10−7. The sum of the bits allocated to the subchannels based on a given Rtarget (i.e., the target bit number) is determined by the equation Btarget=Rtarget/Rsymbol, where the term Rsymbol is a source symbol rate. In the T1E1.413 standard, Rsymbol is 4 kHz. In S 101, SNRs for each of the subchannels are measured using standard routines, which are specified by the T1E1.413, where the output spectrum density for each subchannel is set to a constant of −40 dBm/Hz downstream and −38 dBm/Hz upstream. According to these standard routines, in the initialization process for a multi-channel communication system, the central office transmits a MEDELY signal to remote terminals. The bit allocator 11 of the remote terminal compares the MEDELY signal received from the central office with the MEDELY signal stored in the bit allocator 11, and calculates SNRi (i=0, 1, 2, . . . , N) for each subchannel from differences therebetween. In S 102, the bit allocator 11 calculates the greatest allocable bit number bi of each subchannel and then calculates the sum Bmax of the greatest allocable bit numbers of the subchannels, using Equations (1) and (2). In S 103, it is determined whether a difference between the sum Bmax of the greatest allocable bit numbers of the subchannels and the target bit number Btarget is more than a predetermined value α. If a difference between Bmax and Btarget is more than a predetermined value α, the control proceeds with S104. Otherwise, the control proceeds with S105. Comparing Equations (5) and (6) illustrates that the difference between the average system margin Υ m and the target system margin Υtarget is proportional to the difference between the sum Bmax of the greatest allocable bit number and the target bit number Btarget. Accordingly, when the difference between Bmax and Btarget is more than a predetermined value α, the currently allocated bit number of each subchannel is set to a value that is reduced from the greatest allocable bit number bi by a constant ratio. If the difference between Bmax and Btarget is less than (or equal to) a predetermined value α, the currently allocated bit number of each subchannel is set to the greatest allocable bit number bi. 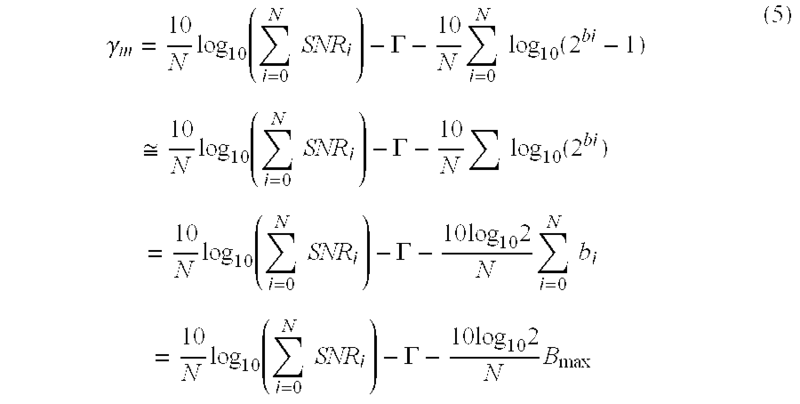 In Equation (7), when 10log 102≈22, N may be represented as the power of 2. Thus, Δ can be readily obtained by calculating the value of Bmax−Btarget and then multiplying the resultant value by 22−log 2 N, which is a simple calculation. That is, under the same SNR, while the margin is reduced for a subchannel having a high allocated bit number, the margin is increased for a subchannel having a low allocated bit number. In addition, it is to be noted that Equation (11) is essentially a reciprocal number of Equation (3). More specifically, when a predetermined bit number is allocated to a given subchannel, the margin m i is an approximate value of a difference between the predetermined bit number and the measured SNR. Accordingly, if the margin mi is large, the system margin of the subchannel is large. On the other hand, if the margin mi is small, the system margin of the subchannel is small and the subchannel has a relatively poor noise characteristic as compared to other subchannels. In S 108, the sum of the currently allocated bit numbers Bi, current of the subchannels is compared with the target bit number Btarget. As a result, if Bi, current is more than Btarget, the control proceeds with S110. In S110, the bit allocator 11 compares margins mi of each channel and selects a subchannel k having the smallest margin. In S111, the bit allocator 11 decreases the allocated bit number of the selected subchannel k by 1. Then, the control returns to S106. As a result of the comparison in S 108, if Bi, current is less than Btarget, the control proceeds with S130. In S130, the bit allocator 11 compares margins mi of each channel and selects a subchannel k having the largest margin. In S131, the bit allocator 11 increases the allocated bit number of the selected subchannel k by 1. Then, the control returns to S106. The foregoing processing is performed until the sum of the currently allocated bit numbers B i, current of the subchannels is equal to the target bit number Btarget. According to the present invention, margins of most subchannels are set to be similar. However, there arises a difference between the total system margin and each system margin. As a result, it cannot be ensured that a bit error rate of each subchannel is 10−7. To solve such a problem, an optimum algorithm according to the present invention is preferably implemented, which makes it possible to render the margins of all subchannels conformal by adjusting transmission power. For example, optimization can be achieved by decreasing the transmission power of a subchannel having a large margin by a remaining margin and/or increasing the transmission power of a subchannel having a small margin by a deficient margin. FIG. 4 is an exemplary diagram illustrating a margin distribution of each subchannel that results from a bit allocation method according to the present invention. Referring to FIG. 4, because the allocated bit number of each subchannel should be an integer, the system margin of each subchannel may be larger or smaller than the sum of a SNR gap and the given system margin Υ m. In the case that the calculation result of Equation (1) is a real number without an integer, the result should be rounded to allocated bits of an integer. In other words, if the bit number that is an integer more than the result of Equation (1) is allocated to a subchannel, a margin of the subchannel becomes smaller than the given system margin Υm. Also, if the bit number that is an integer less than the result of Equation (1) is allocated to a subchannel, a margin of the subchannel becomes larger than the given system margin Υm. The margins of each of the subchannels may be implied in the margin function mi as defined above. In FIG. 4, the broken line represents the system margin mi of the subchannels. That is, a system margin mi of each subchannel is obtained by a ratio of a measured system SNRi and the number of allocated bits. Thus, a system margin mi of each subchannel has a different slope from the system SNR (indicated in FIG. 4 by the solid line). The transmission gain coefficient p i calculated by the bit allocator 11 is stored in the transmission gain table 13. The transmission gain table 13 can fine-tune the transmission power in the subchannels by multiplying the transmission gain coefficient pi of the ith subchannel by the transmission power of the ith subchannel generated from the QAM encoder 12.
adjusting the currently allocated bit numbers of one or more subchannels until a sum of the currently allocated bit numbers is equal to the target bit number. reducing a number of the currently allocated bits of the selected subchannel by 1.
increasing a number of the currently allocated bits of the selected subchannel by 1.
for each subchannel, determining a transmission gain coefficient of the subchannel using a difference measure between the margin of the subchannel and the average margin of the subchannels. adjusting the currently allocated bit number of one or more subchannels until a sum of the currently allocated bit numbers of the subchannels is equal to the target bit number. wherein the Bmax is the sum of the greatest allocable bit numbers, Btarget is the target bit number, and N is the number of subchannels. wherein the SNRi is the SNR of the ith subchannel, γm is the system margin and wherein Γ is a SNR gap. reducing the currently allocated bit number of the selected subchannel by 1.
increasing the currently allocated bit number of the selected subchannel by 1.
where bci is the currently allocated bit number and SNRi is the SNR of the ith subchannel. adjusting a transmission power of one or more subchannels to make a margin of each of the subchannels substantially conformal. for each subchannel, determining a transmission gain coefficient of the subchannel using a measure of a difference between the margin of the subchannel and the average margin. is   γ system = 1 N  ∑ i  m i .
p i = m i - γ system   ( dB ) . means for adjusting the currently allocated bit numbers of one or more subchannels until a sum of the currently allocated bit numbers is equal to the target bit number. means for determining a transmission gain coefficient of each subchannel, wherein the transmission gain coefficient for a given subchannel is determined using a measure of a difference between the margin of the subchannel and the average margin. 18. The device of claim 17, wherein the transmitter further comprises a transmission power adjustment module for adjusting the transmission power of a subchannel using the transmission gain coefficient of the subchannel. 19. The device of claim 18, wherein the transmission power adjustment module comprises a transmission gain table that stores the transmission gain coefficients determined by the bit allocation module.